The sclerotium of Polyporus umbellatus (Pers.) Fries. of family Polyporaceae. The sclerotium mostly parasitizes on the rotten root of birch, Chinese sweet gum, etc. Shaanxi, Hebei, and Yunnan provinces, etc. Dug and collected in autumn and spring. Large, firm, black and bright in the skin, white inside, and full. Sweet, bland, neutral; kidney, and bladder meridians entered. Induce diuresis to alleviate edema. Its action of inducing diuresis is stronger than Fu Ling . It is indicated for all kinds of edema due to water-damp retention. For edema and dysuria due to water-damp retention, it could be used singly or combined with damp-draining diuretic. For instance, it is combined with Fu Ling, Ze Xie, Bai Zhu, Gui Zhi in Wu Ling San from Shang Han Lun. For dysuria due to yin deficiency with heat, it is combined with heat-clearing, yin-nourishing and diuresis-inducing herbs. For instance, it is combined with Fu Ling, E Jiao, Ze Xie in Zhu Ling Tang from Shang Han Lun. It can arrest diarrhea by inducing diuresis. It is suitable for diarrhea of water-damp type. 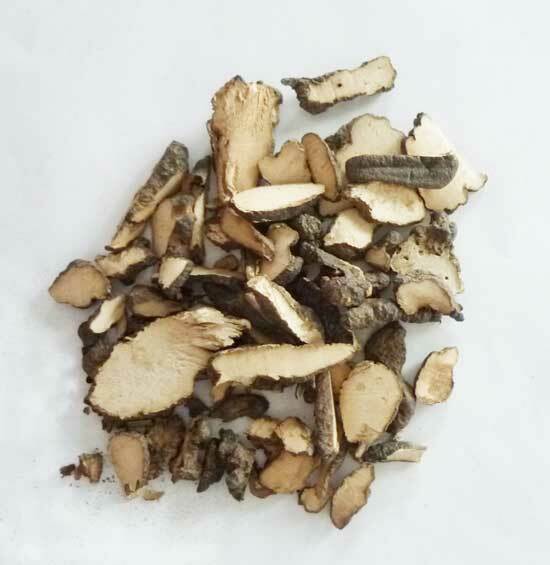 It is often combined spleen-invigorating and diuresis-inducing herbs to increase curative effect. For instance, it is combined with Fu Ling, Ze Xie and Bai Zhu in Si Ling San from Dan Xi Xin Fa. For frequent diarrhea due to damp-clod retained in stomach and intestine, it should be combined with middle-energizer-warming, intestine astringing and diarrhea-checking herbs. Fe instance, it is combined with Rou Dou Kou in Zhu Ling Wan from Sheng Ji Zong Lu. Additionally, it is indicated for stranguria, profuse leucorrhea, downward flow of damp turbidity to the foot and jaundice for its action of draining dampness.